I mean, come on, I really could not care less if people think I'm a jam goddess or domesticated. Or anything else really. LOL. That'd be kinda weird. But! 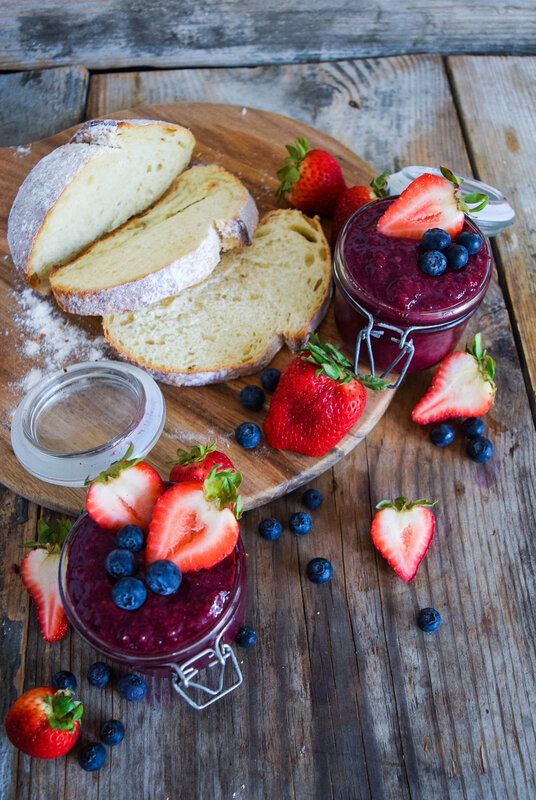 I did feel really happy while making this berry jam. It was oddly satisfying. And seeing the final product - all the jam sealed nicely in my cute jars - made me feel like my life was super put together. Which is always a nice feeling, right? Right. This recipe made quite a large batch. Feel free to half it. It will still turn out. 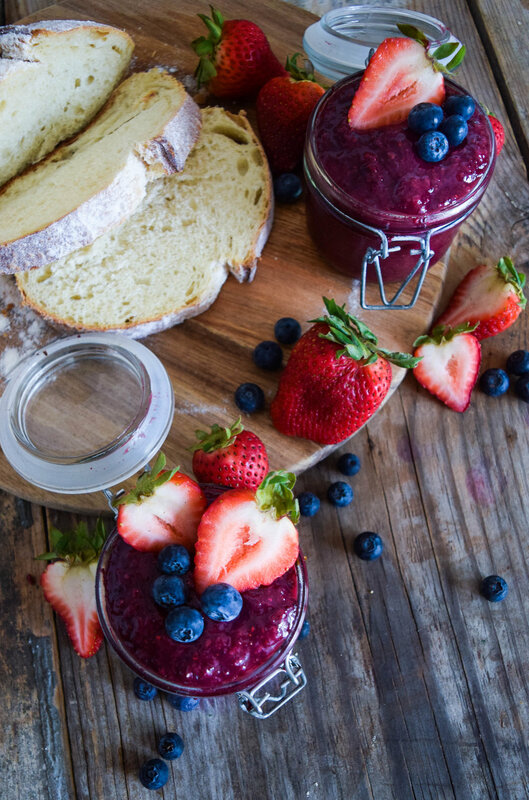 You might also wanna check out my 20-Minute Strawberry Chia Seed Jam recipe if you're looking for something with just one flavor. Okay this is random, non-jam related, but - Is there anything better than showering and putting on good lotion and getting under a comfy blanket? This is my current situation and I'm thinking it might score a 100 on the cozy scale. It's the best! Do you agree? Alright, I'm off to bed. I have a long day tomorrow and I already know the pupper is going to wake me up with the roosters. I'm praying this early rising doesn't last forever. I'm definitely not a morning person haha! 1. Add berries to a food processor or blender. Blend and chop until the berries are liquified. 2. Transfer the berries to a large skillet. Stir in the sweetener and lemon juice. Cook over medium heat for 15 minutes. You will notice that it starts to thicken towards the end. 3. Stir in chia seeds. Continue to cook for 1 more minute. Remove from heat and let stand for 15-20 minutes to thicken. 4. Store in an airtight container or jars and store in the fridge for up to 2 weeks.